This week, NASA’s New Horizons probe made the first ever flyby of distant, frozen Pluto. We were wondering how much the mission cost, how that stacked up against the price of other space exploration, and how that looked in context with other expenditure…in this case, the war in Iraq. We’ve produced an infographic to try to make sense of it all. Please share it! The basic take-home message here is that space exploration is cheap: an ambitious space mission might cost a couple of billion dollars, which is a few dollars per American, or euros per European. As our Rosetta infographic points out, it’s also important to remember that these costs are spread out over the duration of the mission, which is often a decade or more. That means exploring space costs literally cents per person per year, for which we get spectacular images, important science, and the ever-present possibility of spin-out technologies which can transform our everyday lives. By comparison, the war in Iraq is estimated to have cost the US alone three trillion dollars. We had to divide that up into a per month cost just to get it to fit on the graphic, and even then it dwarfs the cost of space science. Sending New Horizons to Pluto cost less than an average day in Iraq. Each of these missions is fascinating in its own right, so do read more about Voyager, Curiosity, Rosetta and Dawn. But of course the limelight at the moment is firmly on New Horizons as the first high-resolution images of Pluto’s mysterious surface trickle back to Earth. Massive congratulations to the team! All the data we used in this infographic are available in a Google Spreadsheet. I think it is a much better investment to spend the money here on earth, helping people. Space exploration does help people on Earth, Linda! Lots of technologies were invented as by-products of space exploration: see this NASA list of spin-offs for starters. Plus, space exploration inspires the next generation of scientists and engineers, regardless of whether they’ll go on to work in biology, renewable energy, or space science. 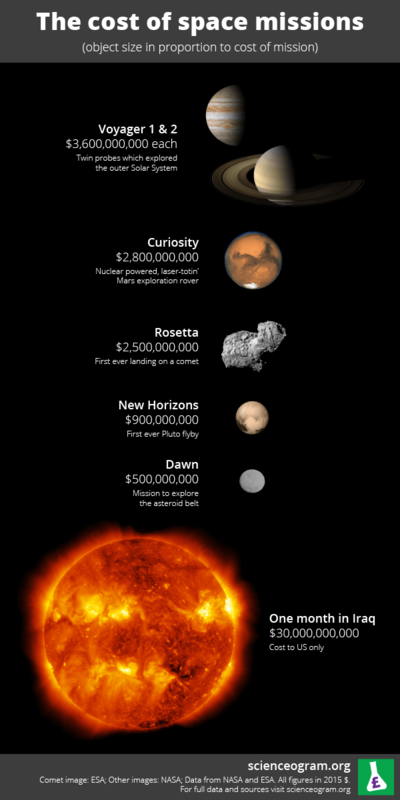 Finally, far more money is spent in ways far more wasteful than exploring our universe, as we hope this infographic illustrates. If you want to help people on Earth, there are some pretty big-ticket items you could redirect spending from first. We need to explore space. It is our future. We need to do it now for many reasons. It’s going to be a interesting ride. Exciting! Linda, that money is spent here on earth helping people. For unmanned scientific missions all of the salaries are paid, materials purchased, and hardware constructed HERE, on Earth, and in turn those initial outlays are redistributed throughout their local communities again, and again, and again. Middle class homes are built, restaurants are frequented, teachers are employed, plays are attended, etc. A peaceful and constructive stimulation of the economy, with countless spin-offs, takes place throughout. Contrary to what it seems people think no bullion is sent aloft and no capsules are crammed with cash. The money never leaves the ground. Some of it may even be in your pocket. If you want to rail against the military’s use of space be my guest, but for scientific exploration in the pursuit of knowledge please consider both the dynamics and benefits of the investment. “spend the money here on earth, helping people.” ROTFLMAO!! Did you really believe we were paying the aliens? talk about a waste of money! we should be using this money to prove the facade that is global warming, or to set up a registration system for firearms. war does NOT help people, kills them. I’d have to agree with the smarter people here, where do you think the technology to track things like global warming come from? How about some realistic solutions to mining and energy production, just think how much less pollution there would be if we mined and refined materials off world; we could preserve every remaining ecosystem and still continue to grow. Maybe if even 1 percent of our money was spent on research places like NASA would have a little more to show for there efforts. Do you have a source for the figure you put on the Iraq War? You say “the war in Iraq is estimated to have cost the US alone three trillion dollars.” Whose estimate is this? Is that just in terms of actual dollars spent, or does it include things like the effects of the war on the US economy? Everytime I see someone complain about how we should be spending the space program’s money here on Earth instead, I always wonder if they’ve actually looked at the figures. It keeps being hammered home: one half of one percent of the budget. 1/2 of 1%. So is it that 1/2 of 1% that has kept all our Earthly problems from being solved? Before NASA, did we live in an Earthly paradise, that suddenly became rife with problems once that portion of the budget was diverted to space? Also, there will never come a time when someone, somewhere can’t complain that we have too many problems here, and should spend all the money on Earth. The boons to humankind brought by the space program are numerous, and benefit each of us everyday. But do the Lindas and the small m marks address any of that? No. They continue to look at the ground, never realizing or acknowledging that it’s those who look towards the stars that have made their lives, and the lives of countless millions, better. @Alex Knight. Wow, what an ignorant and idiotic diatribe. Equating taxation with violence is borderline offensive, especially for those who have suffered at the hands of literal violence. It’s also disingenuous, since you try to steal the spotlight from this program and instead use it for your anti-tax diatribe. The irony of this is that your little essay fails to tackle the obvious that was pointed out here: The Iraq war cost more on a daily basis than it New Horizons Probe in its entirety, yet I don’t see you railing against that, nor do you offer any ideas or solutions (typical) as to how a country is expected to function or pursue these kinds of things without some sort of taxation infrastructure. You think the private sector would spent 700+ million on a probe to Pluto? Not a chance. In fact, the private sector won’t bother investing in anything until the necessary infrastructure is in place, so who is expected to do that other than government (since that is essentially their job)? I think you picked the wrong forum to air your faux-intellectual diatribe. @Alex Knight. Wow, what an ignorant and idiotic diatribe. Equating taxation with violence is borderline offensive, especially for those who have suffered at the hands of literal violence. It’s also disingenuous, since you co-opt this mission not to debate its merits but instead use it for your anti-tax vitriol. The irony of this is that your little essay fails to tackle the obvious that was pointed out here: The Iraq war cost more on a daily basis than it New Horizons Probe in its entirety, yet I don’t see you railing against that, nor do you offer any ideas or solutions (typical) as to how a country is expected to function or pursue these kinds of things without some sort of taxation infrastructure. You think the private sector would spent 700+ million on a probe to Pluto? Not a chance. In fact, the private sector won’t bother investing in anything until the necessary infrastructure is in place, i.e., the government builds it for them. And why wouldn’t they? That is essentially the government’s job, to maintain the country’s infrastructure and facilitate business opportunity. I think you picked the wrong forum to air your faux-intellectual diatribe on the “violence” of taxation.